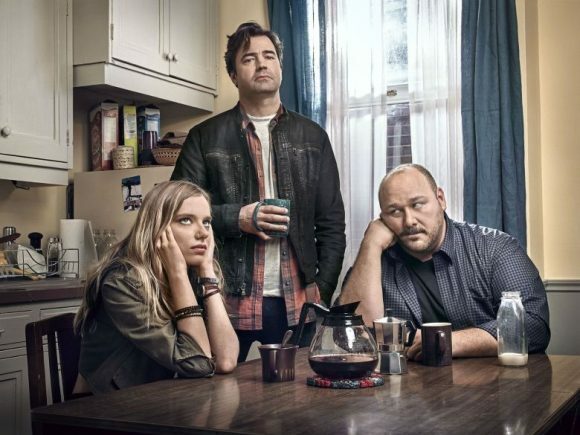 ➢ “It’s probably not surprising that if you make a comedy about an irascible, burned-out former music writer and alcoholic who now spends his time as a substance abuse counselor, the pilot would probably be a bit over-the-top on the grumpy grunge of the main character, in this case Sam Loudermilk, played by Ron Livingston. And yes, the first episode is funny if overly intent on leaning hard on the ‘abuse counselor is abusive to everyone’ schtick. But it’s also well-written and engaging, which should get you to the second episode. That’s where the show prevails and, over the course of four episodes sent to critics, continues to become more winning, creative and, dare it be said, likeable.” — The Hollywood Reporter. ➢ “Loudermilk stars Office Space’s Ron Livingston as a onetime hotshot rock critic in Seattle back in the 1990s who had written a couple of books. Now he’s a recovering alcoholic. He heads a recovery group and makes money by polishing floors in banks … The series from Peter Farrelly (Dumb and Dumber, There’s Something About Mary) and Bobby Mort (The Colbert Report) has an appealing likeability to it. Mostly, that is thanks to Livingston who always keeps the character real.” — Los Angeles Daily News. ➢ “This surprisingly appealing dramedy symbolically picks up where Gen-X totems like Singles and Reality Bites left off decades ago, packed with cynical but hilarious Louie-like moments of honesty. There’s a tender heart that beats beneath Loudermilk’s misanthropy, especially when it delves into his work moderating group-therapy meetings and his attempts to help a young addict (Anja Savcic) get her act together.” — The Washington Post. ➢ “Though it feels contrived at times, or willfully outrageous — this is Peter Farrelly of the Farrelly Brothers, remember — it can also be authentically charming … Even when the plot feels contrived, it’s not uninteresting; even where the characters are underdeveloped, you root for them … Given long-arc ambitions and unfinished business, Loudermilk being as broken as any of his charges, I expect that the remaining episodes will put some spin on or add some depth to what’s come before. But even if it doesn’t, Loudermilk won’t have wasted your time.” — Los Angeles Times. ➢ “With such a honest look at how with this disease affects people, it’s frustrating when Loudermilk also reverts to laboured setups to punchlines that don’t need them. For every grounded moment that features the consequences of alcohol affecting these people’s lives, there’s a forced sight gag set up by 30 seconds of misdirection. The result is a show that feels like it has to shoehorn Sam’s assholery to counterbalance the ways he’s helping the people in his orbit. Even as a counselor, he’s not the gentlest, best-practices kind of mentor, but at least there’s work here to make those attempts feel justified and earned.” — IndieWire.